President Bush will propose a whole slew of new and innovative ways to micromanage American lives under the guise of providing a better future for ourselves and our children, none of which he has any power to implement under the Constitution. Despite the multibillion-dollar cost of these brave new programs, he will propose a tax cut of unprecedented proportions. Wild applause will greet his latest plans to gut our self-evident freedoms because, he will argue, slashing our liberty will make us safe from the terrorists. He will say nasty things about anyone who would stand in the way of making USAPATRIOT permanent. 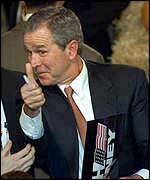 Six months from now, even if our lives depend on it, which they won't, no one will remember anything Bush said tonight. The coverage in The Onion will be more compelling than anything the mainstream media has to offer. And twice as many people, including myself, will watch "American Idol" than the address. UPDATE: Oops, it seems Fox plans only a one-hour "Idol" and will break away at 9 for the prez. Oh well, two hours of TV on a Tuesday night gets old anyway.